… but I’m in St. Paul. Ah well. 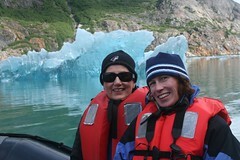 Two days ago I returned from a fantastic cruise in Alaska, which I enjoyed with my mom. We feasted more on the amazing natural scenery and bounteous knowledge of the naturalists on board, than we did on the food and drink that is often characteristic of Alaska cruises. Not that the food and drink wasn’t good or plentiful – it was just overwhelmed by the frequent need for binoculars, cameras and/or rubber boots. There are likely a variety of ways that I could properly, enjoyably “do” Alaska. The way that we did this trip, with the help of National Geographic/Lindblad Expeditions (LEX) was one of them. I plan to get back, perhaps in similar fashion, to check out other parts of the state with my husband. Here’s how LEX promoted our trip, though perhaps the most telling feature is that our ship, the Sea Bird, was just large enough for 62 guests plus crew. The trip description was accurate in the nature and variety of what we’d see and do, but not in the volume! I found myself strangely thankful that we weren’t further north, where the days were even longer, and I’d have gotten even less of a cue to curl up in bed for some shut-eye. The most breathtaking moment for me on the whole trip was on the morning that some killer whales swam alongside (and in front, and under) our ship. I was down in the lounge getting my first cup of coffee around 6:45 a.m. when the Expedition Leader, Cindy Manning, spun into the room, preparing to make the morning’s first gentle announcement over the P.A. To us in the room, she hooted, “Yippee! Black and whites! We have killer whales, off the bow!” While hearing that over your morning coffee is memorable enough, the more amazing thing came for me, moments later. 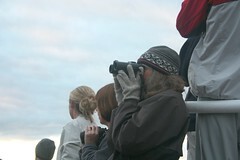 We were shortly up on the main observation deck, all of us with cameras, and most of us with binoculars, watching every single above-water move that a family group of five killer whales was making, as they swam along, mostly ahead of us. I had a brief moment of trying to recall a grade-school lesson, about one of the big aquatic animals, for which it was often hard to remember whether it was a mammal or not. And then, one of them breathed. Blew out, then in, through his-her blowhole. Loudly. It was amazing to hear it; we were that close. I heard it repeatedly, as they seemed to just be swimming along with us, bobbing up and down along the surface. One of two of them appeared to be younger, or, especially playful: we were treated to some half-breaches and tail-slaps, shortly before we parted ways. The prior few days we had seen several humpback whales (I can check that off my bucket list! Wow!). The first thing we identified, with them, was often the spout or “blowing,” though they were usually so far away that we couldn’t hear it. Hearing the killer whales’ breath was both wondrous and grounding. The second most amazing thing we experienced were the tidewater glaciers – both when calving and when not calving! LEX posted a great video of the natural fireworks show, here. 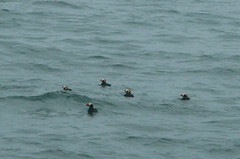 Seen from the ship: A raft of sea otters. Steller sea lions, harbor seals. The aforementioned killer whales and humpbacks. Tufted and horned puffins. Kittiwakes, marbled and Kittlitz’s murrelets, pigeon guillemots, glaucous-winged gulls. Brown bears, feeding on a whale carcass. Black bears, berry-picking. 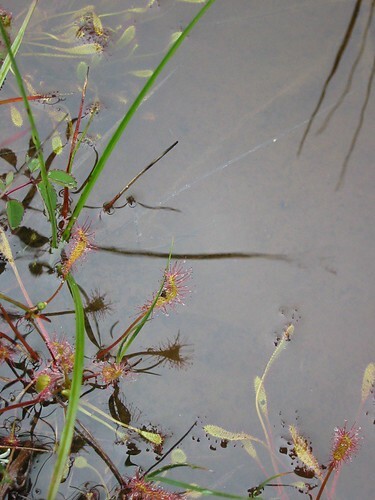 Seen on one or more of the daily hikes: muskeg (2 hikes were on bogs), two types of carnivorous Sun Dew plants, three types of orchids, lots of lichens (including “British soldiers”), a twin flower, a golden thread seed pod, lots of Sitka spruce and Western hemlock, several types of fern, bunchberry (biennial dogwood), four kinds of bear evidence (mostly brown bear). Seen from sea kayaks and/or Zodiacs: icebergs of all sizes! Some seeming to defy gravity. Awesome granite glacial scrapes. Bubbles in icebergs. Jellyfish! Harbor seals. Bald eagles. Columbine, monk’s cap. A dogwood tree, growing off a sheer marble cliff, like a vine. Having nearly unlimited access to several very knowledgeable and friendly naturalists, for 8 days, in the Alaskan wilderness (inasmuch as we saw from the various watercrafts, and on hikes). They knew what EVERYTHING was. And they shared so much information about that everything! They led the hikes, and each day there were short lectures on topics that related to what we’d be visiting, that day. A fun afternoon shore visit, in the fishing village of Petersburg. Linda Nicklin gave us a great “dock walk” and pointed out the different types of fishing rigs, there. Ten days with my Mom, who lives far, far away from me. We really enjoyed the rare time together, playing around in kayaks, looking at/identifying plants, getting to know other passengers. Seven days with nearly 90 very interesting people (60 passengers plus about 30 staff). I made some good friends, that week! A short but excellent visit with my uncle Dave, cousin Juli, and my Dad, in Seattle. Love those ferry boat rides! Three naps, a massage, great seafood to eat every day (and some tasty vegetarian dishes, as well), discovery of several of Alaskan Brewing’s fine beers, the opportunity to gaze at some beautiful icons at St. Michael’s Russian Orthodox Church, a closer look at a bald eagle at the Alaska Raptor Center, some great Qigong warmup exercises in the mornings (surrounded by very distracting scenery, on the bridge deck), and the gentle rocking of the Sea Bird, putting me to sleep, eventually, each night. What a perfect trip! I’ve finally vetted my photos: check them out, here. If you think 91 97 is a lot, know that I started with over 500. Hi Arah! What a fantastic blog! I’m Lindblad’s Marketing Manager for Alaska expeditions and just wanted to say we’re so glad that the experience was so memorable for you and your mother. Thanks again for the kind words. If you ever need anything Alaska related feel free to shoot me an email to marc@expeditions.com. Happy travels and keep blogging!